This traditional design from the Bundled Reed collection is a beautiful accent to any kitchen or bathroom furniture or cabinetry. Multiple finishes available. Fasteners are sized to work with standard 3/4 in. drawer fronts and cabinet faces. Installs easily for an instant, noticeable change. The Liberty 1-1/4 in. Satin Nickel Channel Knob features subtle detail and a distinctive finish to add casual style to your kitchen and bathroom cabinetry. Make a statement without having to say anything at all when this knob is displayed. Installation is easy and the necessary hardware is included. The traditional style of the Liberty 1-1/4 in. Antique Brass Round Knob provides a refined finishing touch to your decor. The hand-rubbed antique brass finish adds warmth to your cabinetry. Mounting hardware included for easy installation. Add the perfect decorative accent to your traditional styled kitchen or bathroom cabinetry with the Liberty 1-3/4 in. Clear Acrylic Knob. With its classic design and combination Clear Acrylic with elegant Satin Nickel finish, this knob is sure to be enjoyed for years. Includes mounting hardware for quick installation. The Perimeter 1-3/4 in. Bronze Knob has a round shape and comes with hardware for ease of installation. Premium bronze finish with copper highlights. 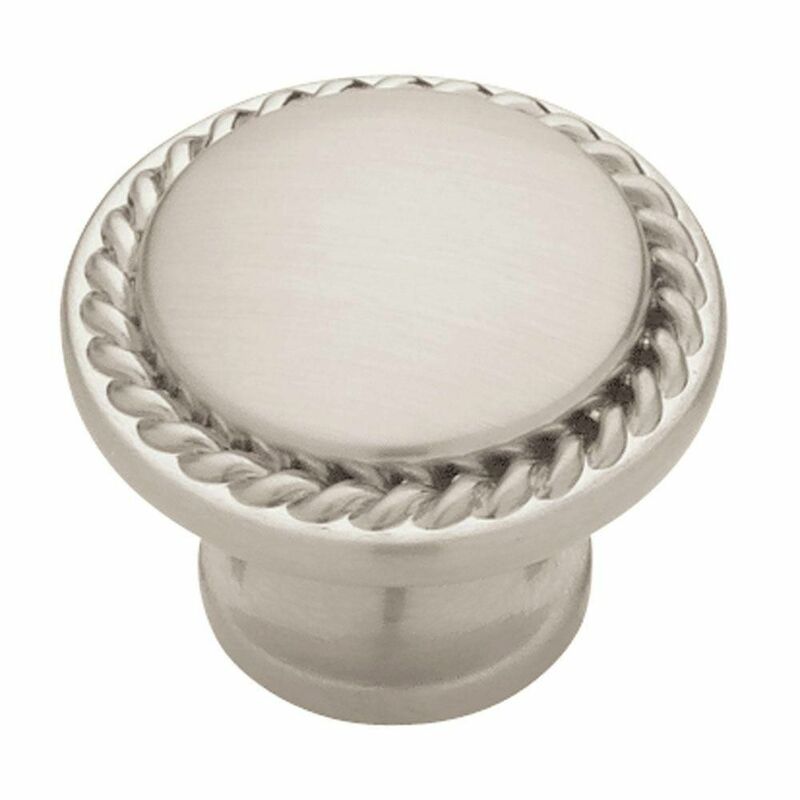 This cabinet knob has a high-quality zinc die-cast metal base construction that allows for years of use. 1-1/8 Rope Edged Knob, 1 per package This traditional design from the Bundled Reed collection is a beautiful accent to any kitchen or bathroom furniture or cabinetry. Multiple finishes available. Fasteners are sized to work with standard 3/4 in. drawer fronts and cabinet faces. Installs easily for an instant, noticeable change. 1-1/8 Rope Edged Knob, 1 per package is rated 4.9 out of 5 by 28. Rated 5 out of 5 by Margo from Nice design. Looks great on my drawers!... Nice design. Looks great on my drawers! Rated 5 out of 5 by PETE from Very pleased with design and quality. ... Very pleased with design and quality. Rated 5 out of 5 by Lisa from Looks great in my cabinets. ... Looks great in my cabinets. Rated 5 out of 5 by Cat from Great quality! Beautiful finish and design! We love them. Great quality! Beautiful finish and design! We love them. Rated 5 out of 5 by KRB52 from These knobs are reasonably priced and add a very elegant... These knobs are reasonably priced and add a very elegant look to the cabinets. Rated 5 out of 5 by Kyle from The handles were delivered in a timely manner and just... The handles were delivered in a timely manner and just as presented through the on line pictures.